EDMONTON — NDP Leader Thomas Mulcair lashed out against Justin Trudeau’s Liberals and Stephen Harper’s Conservatives Thursday, painting them both as cut from the same cloth. Mulcair said the NDP is the only party ready to form a “truly progressive” government. He told the majority of his 96-member caucus, assembled in Edmonton to plot election strategy, that, unlike Trudeau, he does not require on-the-job training. 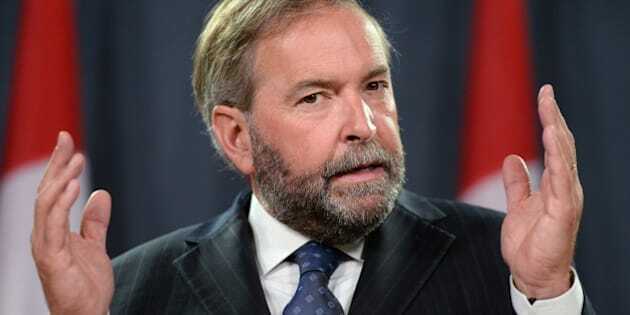 “I’m sorry, prime minister just isn’t an entry-level job,” Mulcair said. The Liberals, he suggested, are asking voters to trust that the party won’t break their promises if elected in 2015, such as Jean Chrétien did when he failed to scrap the GST. “What a joke,” Mulcair said. The Liberals, just like the Conservatives, have taken care of themselves when in power while Canadian families have fallen further behind, the New Democrat leader told his caucus. In French, Mulcair went further, seemingly suggesting that Trudeau’s Liberal party would be corrupt. Speaking to the Canadian Press, Trudeau said he thinks Mulcair's attacks might make the NDP leader appear too much like Harper. "I think we have nasty negativity and divisive attacks from the right. I know Canadians don't want that from the left," Trudeau told journalist Joan Bryden Thursday. The Liberal leader pledged not to return fire with personal attacks of his own. "Canadians don't want that and that's one of the reasons we're doing so well." Trudeau said the tag line the Liberals used in their last television advertisement, "getting ready to lead," was aimed at being honest with Canadians and reflected the fact the Grits are in the process of building a team and a plan which, he said, would be ready for the election campaign. Mulcair told his caucus that the Liberals have no plans to reverse Harper’s corporate tax breaks, no plans to bring in a national child care plan, and no plans to develop a true nation-to-nation relationship with aboriginal peoples. The NDP would offer concrete solutions, Mulcair asserted. He did not, however, detail any of the policy proposals he intends to tackle, such as a helping small businesses create more jobs, making Canada a leader in renewable energy, and investing in 21st century infrastructure. Without spelling out the contrast, Mulcair compared his middle-class upbringing and his age to Trudeau’s privilege pedigree and youth, noting also that he comes from a family of 10 kids and is now a grandfather. After 150 years of red team-blue team shuffle, Mulcair said, Canadians want real change: “They want a government who will reflect their priorities and respect their values.